Starting 2019 on the right foot can quickly lead to foot pain if the shoes you're working out in are not right. 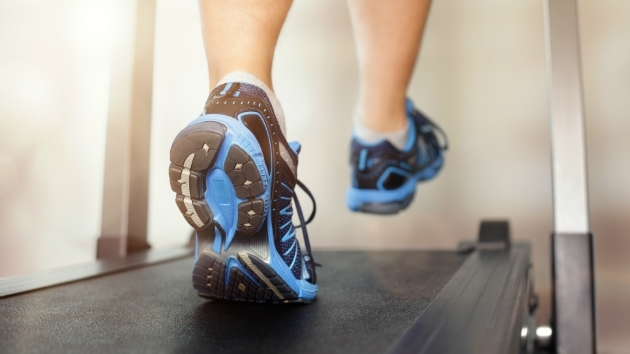 (NEW YORK) — Starting 2019 on the right foot can quickly lead to foot pain if the shoes you’re working out in are not right. Whether you are running, cross-training or weight lifting, comfort is key, according to Stephanie Blozy, the owner of a Fleet Feet Sports store in West Hartford, Connecticut. “If the shoe feels comfortable on your foot, it’s probably going to be less likely to cause injury down the road,” she said. Rebecca Kennedy, master tread instructor at Peloton, which launched its at-home tread workouts last year, said women need to be savvy shoe shoppers to feel and look their best. Here are eight tips from Kennedy and Blozy on finding the perfect shoe:. 1. Try on more than one shoe so you know what you like and don’t like. 2. Buy workout shoes in a half size bigger than your everyday shoe, like a heel, because your feet will swell and expand during exercise. 3. When you find a shoe that fits, try it in a half size bigger and a half size smaller to make sure you have the right size. 4. Don’t be swayed by color or price. Go for the shoe that is comfortable, not the one that is best looking. Expect to pay around $120 for a great running shoe. 5. Go to a store that will fit you for a shoe instead of trying to sell you one. “There are plenty of running stores that will get you up on a tread and film your gate and put you in several different brands and sizes and widths to determine what is best,” said Kennedy. 6. Buy more than one pair of sneakers, ideally from different brands, so you can rotate them, giving the shoes time to dry after workouts and your feet a chance to use different muscles. 7. Pick a shoe based on your activity, so if you run more than two miles in a workout, you should be in a running shoe. If you are doing a HIIT and strength class, like OrangeTheory, wear a cross-training shoe that is closer to the ground and has more flexibility. 8. Replace your running shoes at least every 300 to 500 miles. “I like to just turn [my shoes] over and see where the wear and tear is, how much of the cushion has gone away, does it seem like I’m running on pavement,” Kennedy said.